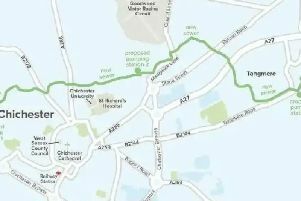 Works are set to resume at the Stockbridge footbridge on Monday (January 21). Two lighting columns are to be replaced and temporarily installed equipment and a footpath are to be removed from the site, which has now been fenced off for over a year. The footbridge was originally due to open on April 6 but tests in April and August last year showed the bridge was moving 'unacceptably'. Highways England has said the works will be carried out overnight between 8pm an 6am from Monday to Friday February 1 but said the works are 'weather dependent'. A spokesman for Highways England said: "Our contractors, A-one+, will carrying out the reinstatement of two lighting columns at Stockbridge Footbridge, the removal of the temporary footpath along the southside of the A27 between Stockbridge Footbridge and the canal path and associated temporarily installed equipment, fencing and CCTV, and the demobilisation of our works compound. "In order to carry out these works as efficiently and as safely as possible, these works will be carried out using a lane one closure of the westbound carriageway between the canal path and Stockbridge Footbridge."